Moving house is such a great time to purge. My husband and I have been going room by room and cleaning out all the stuff which hasn’t been used in years. Along the way we are finding some lost treasures. Last weekend we found a Nespresso box filled with wrapped Christmas ornaments, hidden back behind our guest pillows. The receipt at the bottom of the box gives the impression that they were purchased on a vacation 7 years ago and the packaging indicates that they have never been used! And today I found a zip lock baggie tucked away in the back corner of my tiny freezer, with what appears to be a portion of chocolate pastry dough. Does anyone else remember why I might have chocolate pastry dough in my freezer? I didn’t, until I did a search of my blog and found this, the chocolate banana tart from 2 years ago! Eek. No need to worry about ever finding leftovers from this week’s recipe, Baby Bok Choy, Sugar Snap Peas, and Garlic. We scarfed it up and barely left a trace in the pan. 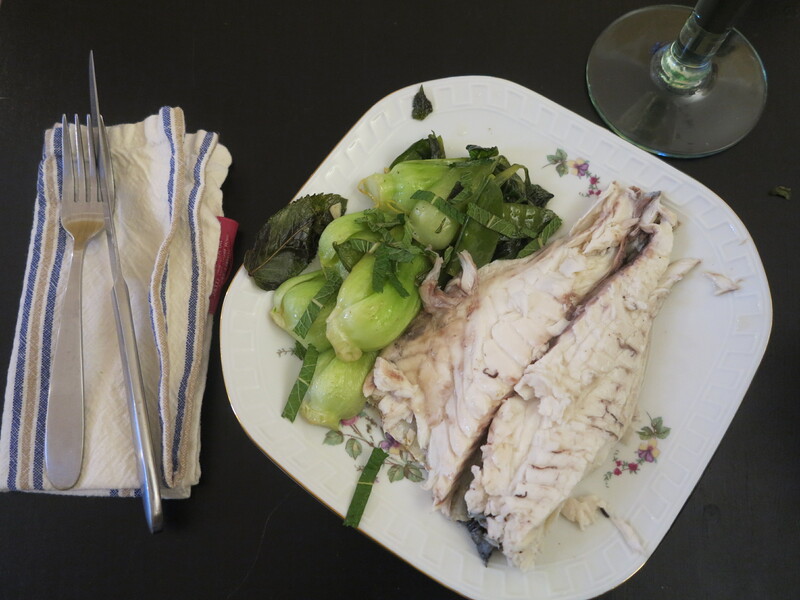 I ended up skipping the papillote part of the recipe and just throwing it in with the fish which I had bought for dinner. To be honest, I wasn’t expecting much from this one, but we both absolutely loved it. It paired perfectly with the fish. We will absolutely be making this one again. Happy Easter. Hoe everyone has a wonderful weekend. This entry was posted in french fridays with dorie and tagged Around my French Table, seasonal - spring, vegetarian. Bookmark the permalink. I skipped the en papillote part too – just as good! I want the fish recipe! What a lovely fun presentation too! I never made that banana tart. Can you send me the tart dough? Your dish out the oven looks amazing. Glad you all enjoyed it. My house could use a good clean out too after 15 years. I’m so glad to know that this works without the papillote too. I love how you used the veggies as the base for that gorgeous fish! Like Liz, I need to purge my whole house. It’s not good to stay in the same house for 20 years. Nothing has been thrown out for years. These veges look perfect with the fish – great combination. Happy Easter! We are getting ready to move next year, so I have been purging and purging and purging. I found unpacked boxes from my first move 10 years ago (and still unpacked from this move 8 years ago) and decided it was time to bite the bullet and sort through them. I like how you did this with the whole fish – looks delicious. I’m looking forward to just such a project, though I am expecting less interesting “finds” when I do!
! Your dish looks terrific. 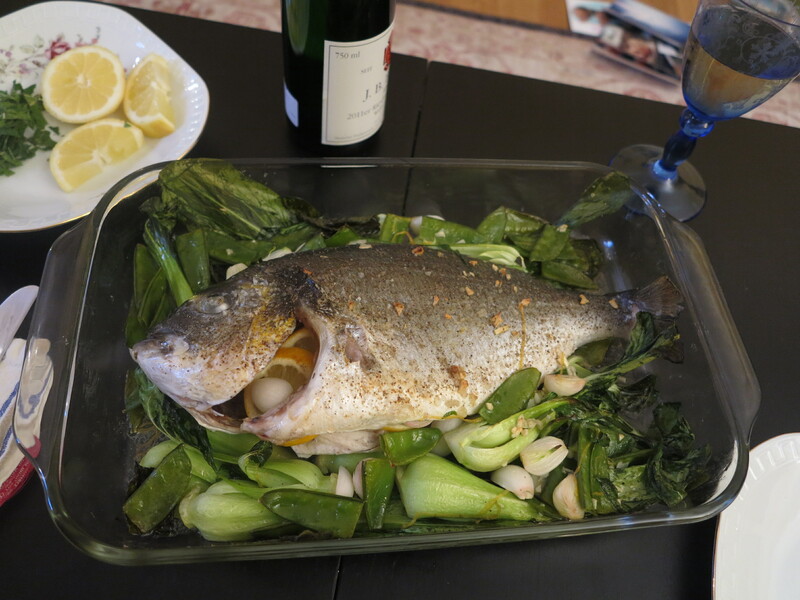 I haven’t cooked whole fish for a long time, but that looks so fun! Oh, what a great idea to use the veggies as a base for the fish! Wonderful combination with the fish… so glad you enjoyed it. I love finding long lost things cleaning. My daughter just found a door that says “Town Clerk’s Office” in our garage… how it got there I’ll never know? Rose – this looks like one fabulous meal! Have a very Happy Easter weekend – hopefully the weather around here will stay nice, sunny and warm! Frohe Ostern! I recently threw away a baggie of chocolate pastry dough left over from that very same dessert! Funny! Your meal looks fabulous! What a great and easy way to cook your meal. I have yet to make the banana tart, but I see Trevor has dibs on your leftovers. I guess I’ll have to make my own. Your fish looks fabulous and perfect with the vegetables. Good luck with packing – I hope you find some more forgotten treasures. I know exactly what you mean about finding different things you didn’t know you had or thought you lost when you are moving houses. I am going to be going through a major purge session in the summer before we move to Athens! Unfortunately I did not make the Baby Boc Choy recipe this week but I will be soon thanks to all the rave reviews I am reading from almost all the Doristas! Let’s talk about the fish – what kind was it? A lovely thought – making it into a one-dish meal. Looks delicious. I do think you should try some veggie combo with unique spices and flavoring in a foil packet. It’s fun and delicious. Good luck on your purging and moving. As you know, I totally purged a year ago. It’s hard work but, once done, you will feel a bit lighter. New ornaments for next year. Old pastry – tossed (I hope). I feel like I should move just to force myself to purge. What a great opportunity…The vegetables were great but I’m distracted by your delicious looking fish. Hopefully you don’t mind if I copy you and make this one dish meal sometime soon!